whose people we are, God’s well-tended flock. Give thanks to God, bless God’s name. good indeed is the Lord. whose faithfulness lasts through every age. Sister Mary Esther Otter, born Nov. 22, 1933, to Frank G. Otter and Margaret K. Bates, was christened Irene Fernunda that same day in St. Joseph’s Church, New Almelo, Kan., by Msgr. John B. Vornholdt. She grew up on a farm near Clayton, Kan., in Norton County. She was the third child in a family of eight children. Her brothers are Alvin and Marion and sisters Virginia, (Sister Francis Margaret), Donna, (Sister Donna), and JoAnn (Mrs. Roger Long). Two siblings, Rita and Emory, died at birth. Other significant happenings in Mary Esther’s life at this time were: her father’s death in 1956, and her sister Donna’s entrance into the Sisters of St. Joseph. Mary Esther rejoiced for Donna. 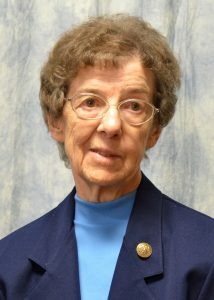 Sister Mary Esther taught for 26 years in Manhattan, Kan., Silver City N.M., Cawker City, Kan., Schoenchen, Kan., Manhattan Kan., and Salina Kan.
During her years of teaching, Sister Mary Esther also assisted with the summer program for migrants in Goodland, Kan., taught religious education classes, and numerous vacation bible schools. In 1980, Sister Mary Esther was invited to assist in the continuing education program in Junction City, Kan., to help immigrants acclimate themselves to a new country. This was a valuable and broadening experience, but due to limited federal funds and other factors, she left after one year. Sister Mary Esther saw this as an opportunity to request time for a deeper inner search of God’s action in her life. She entered the Personal Growth program in St. Paul, Minn., where she spent 18 months with 30 sisters belonging to various communities throughout the United States and Canada and realized that the Church was graced with many strong, talented and faith-filled women. While waiting to get everything in place to have the surgeries needed, Sister Mary Esther learned of reflexology and arranged to take the International Reflexology Course out of St. Petersburg, Fla. She was able to take this course in Des Moines, Iowa, and received a certificate in the Ingham Method of Reflexology. After having surgery on her feet and recuperating, Sister Mary Esther felt like she had a new spirit. This gave her the urge to find a new ministry. In January of 1985 she accepted an invitation from Sister Viatora Solbach to assist in opening a hospitality house in Junction City for women and women with children needing a place during crisis times. Sisters Viatora and Mary Esther wrote for grants and appealed to the administration of our congregation for aid. Sister Mary Esther mentions that the administration team was of great support. During this time, Sisters Viatora and Mary Esther visited other shelters, many churches in Junction City and spread awareness of their cause throughout the city. It was also during this time that Sister Mary Esther’s mother suffered a stroke on Jan. 6, 1986. Because St. Clare House wasn’t yet ready to open, Sister Mary Esther was able to help with the care of her mother. In February of 1986, St. Clare House was ready for them to move in, and continue readying the house for ministry. In the summer of 1987, Sister Mary Esther experienced her first plane ride to Los Angeles when she and Marrayne attended a religious education congress. Sister Mary Esther felt that perhaps this was a provision by God for her as she would take a longer plane trip to Brazil in late June. After leaving St. Clare House, Sister Mary Esther took a sabbatical that she called ‘a year of nomadic ministry.’ She spent time making a 30-day retreat in Republic, Mo., with the Little Portion Franciscan Sisters. She also spent time at Open Door in Junction City and as a driver in Plainville, Kan. In 1995, she returned to her home parish in New Almelo to care for her mother. While caring for her mother she also ministered at the parish, made craft items for Open Door in Junction City and offered some reflexology treatments. She speaks of learning much from her mother’s suffering during those years. After her mother’s death and because of her own failing eyesight, Sister Mary Esther returned to the Motherhouse in 2000. As was her pattern, her ministry to the “dear neighbor” continued among her sisters here. She Assisted Sister Mary Julia Stegeman in the greenhouse and with the plants in the Motherhouse, took the Eucharist to sisters within the Motherhouse, assisted with recycling, shared in the weekly rosary at Mt. Joseph and lent a hand wherever needed. In February of 2017, a fall and broken hip necessitated that Sister Mary Esther move to Mt. Joseph. As she was able, she continued her ministry of loving presence to Sister Francis Margaret, the community of sisters at Mt. Joseph and other residents. Up to her last breath she had a smile and show of appreciation to all who were present with her. As I reviewed Sister Mary Esther’s life story, I couldn’t help but note the many times she mentioned how she came to see the presence of God in all the events of her life. Often she mentions that she didn’t understand an event in her life but then speaks of a lesson which she thought God was unfolding for her by that happening. The reason I started our tribute this evening with Psalm 100 was because of another piece that she had written. Among Sister Mary Esther’s papers I found a sheet of notebook paper with a line from Psalm 100, “Come with joy into the presence of the Lord.” What followed this line was a prayer written by Mary Esther, which I would like to share with you. Dear Mary Esther, I believe your prayer has been answered and that you are joyfully present in amazement before the face of God. Sister Viatora was my great aunt. I happened across this tribute while searching the St. Clare House. I truly enjoyed reading about all the wonderful things all the ladies mentioned were able to accomplish throughout their lives. May God bless the sisters of St. Joseph!